The First World War would have ended two days earlier had the Germans not been so disorganised, a newly-discovered account by a British serviceman reveals. 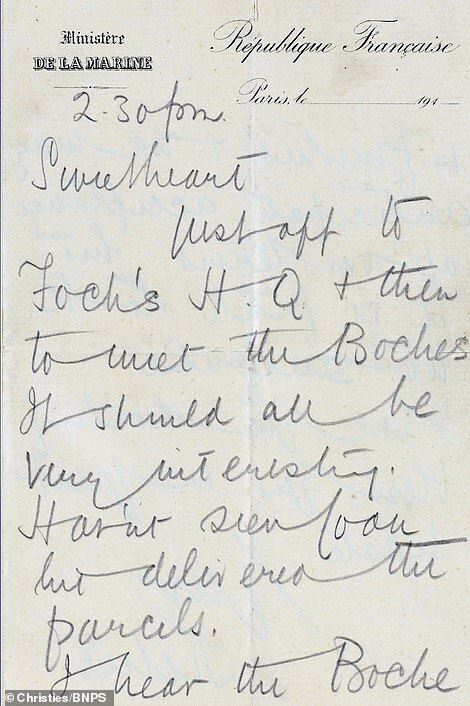 Captain Jack Marriott was one of four British participants in the Armistice negotiations and kept notes of the historic meetings in November 1918 after the agreement was signed in French dining car 2419D in the Rethondes. In one extraordinary passage he recounts how the terms of the peace treaty were meant to have been sent by telegram to the German high command, but their delegation forgot to bring the code to enable this. So the papers had to be driven from the front line to the German HQ in Spa, Belgium, delaying the signing by 60 hours. 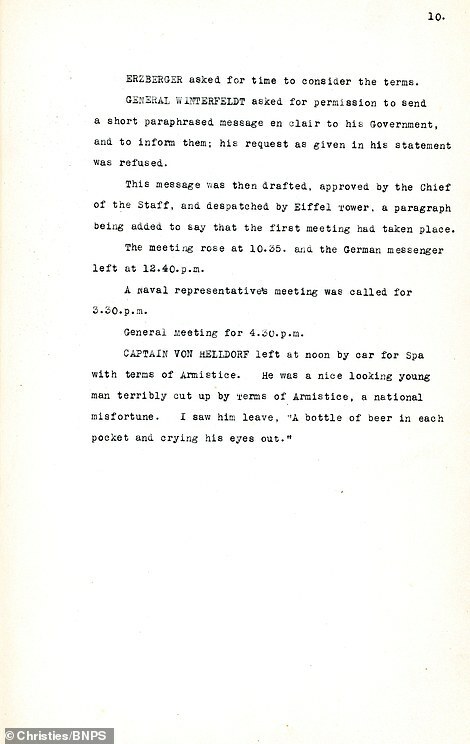 In his memoirs Capt Marriott also described seeing a distraught German officer clenching two bottles of beer and ‘crying his eyes out’ during the negotiations. And the momentous news almost didn’t reach King George V as Capt Marriott had to try 30 times to get through to Buckingham Palace due to a bad line. After the Armistice was finally signed in a forest setting outside Paris, the British delegation celebrated in remarkably understated fashion. The fascinating revelations feature in his memoirs which have emerged for sale for £15,000 with London auctioneers Christie’s. 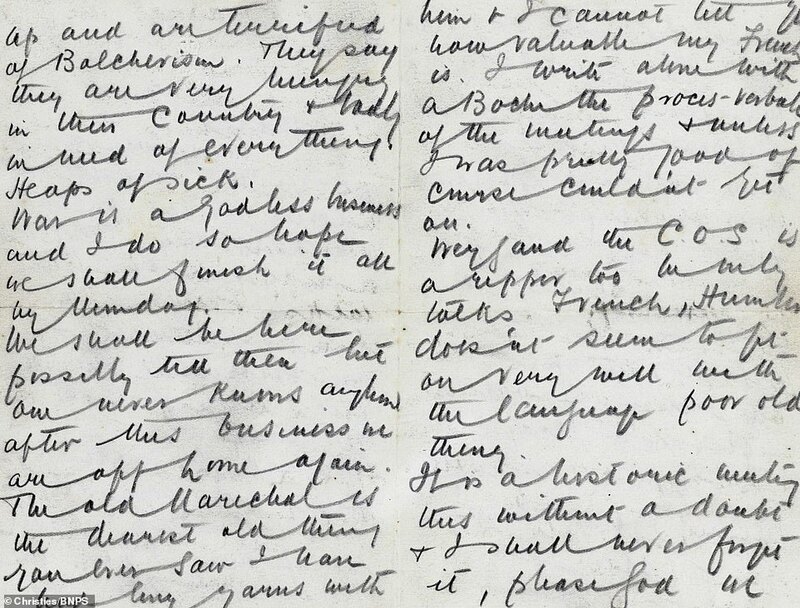 ‘We had 2 meetings y[ester]day & I have never seen a more miserable lot of men, I feel they know the game is up and are terrified of Bolchevism [sic]. 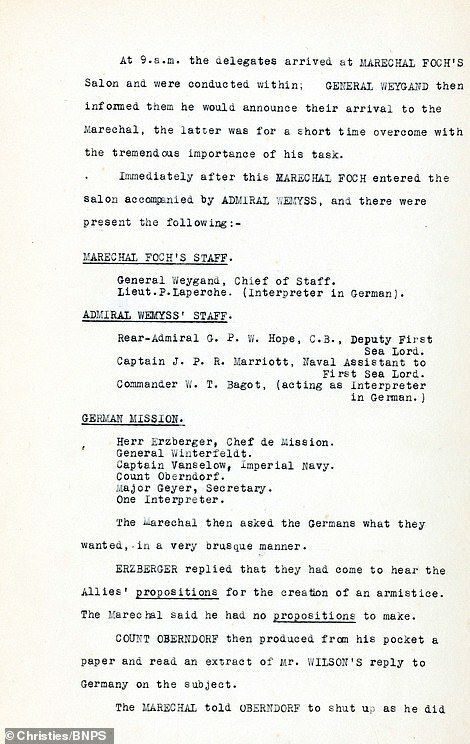 Documenting the delay in the signing, Capt Marriott added: ‘(Count Alfred Graf von) Oberndorf (of the German foreign ministry) asked for permission to be put in touch with a W/T station, so that he might remit the terms to the German Government and the high command. 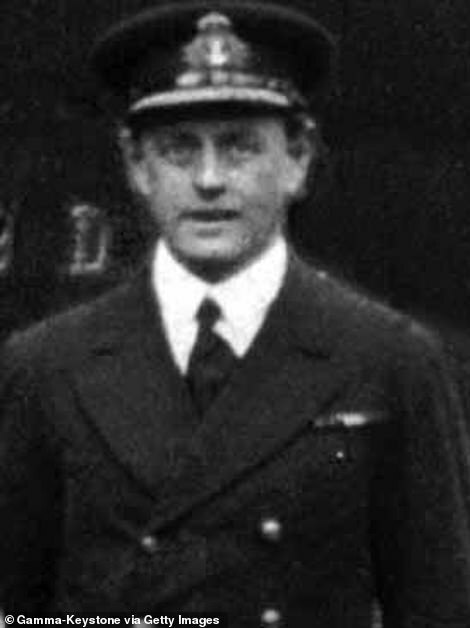 As a result, the young German officer Captain Von Heldorf was sent off by car at noon on November 8 to Spa in Belgium where the German high command were based to hand deliver the terms of Armistice. It was a task which caused him great angst as he shed tears for his country’s defeat. The end of the war was too much to stomach for one of the German delegation, the young officer Captain Von Heldorf, who shed tears for his country. Two days of impasse followed until he finally returned with the signed terms at midnight on November 10. 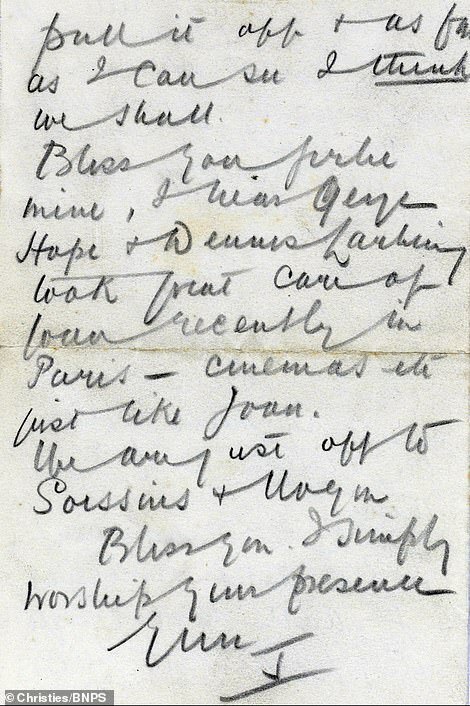 Capt Marriott added: ‘On November 9th, we had a quiet day and did not see the Germans, so took a car and went to the front. ‘[Sunday, November 10th]. All day we had been expecting news of a final meeting, and though the Germans had till Monday, 11th November at 11am to give an answer, we expected it sooner. French general Marshal Ferdinand Foch, British representative Admiral Rosslyn Wemyss and the four German delegates signed the document which declared an end to the war at 5am on November 11. 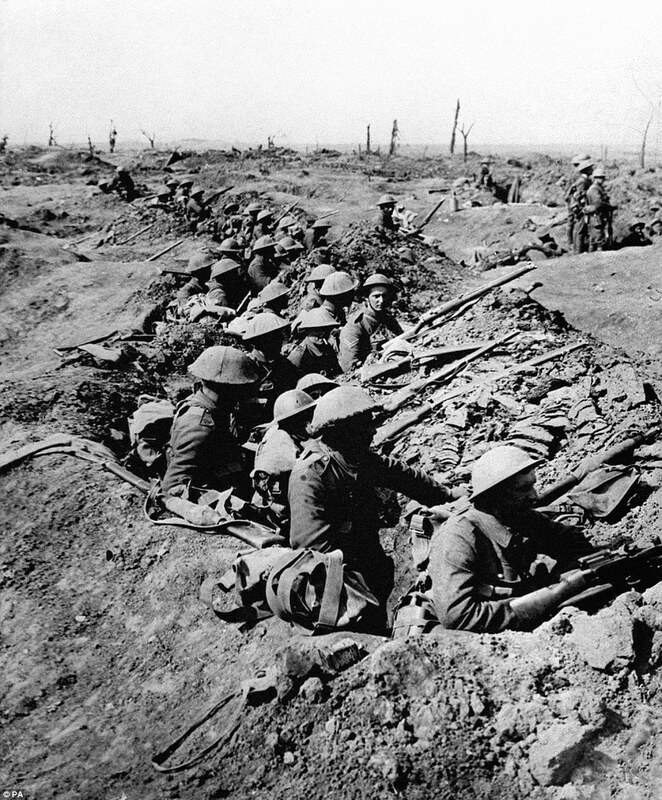 The guns fell silent exactly six hours later, at 11am on the eleventh day of the eleventh month of 1918. The 37-page memoirs, which were typed up after the war, has been passed down Capt Marriott’s family for several generations. They are now owned by a private collector who is selling them at auction. Thomas Venning, specialist at Christie’s, said: ‘It is extraordinary to get descriptions of the events in the railway carriage in Compiègne Forest by one of only four British participants. ‘Capt Marriott’s letters give a remarkably vivid account of the atmosphere and personalities of the Armistice negotiations. ‘It appears there was a day when everyone was sat around doing nothing as they waited for the terms to be taken to Spa and brought back to the forest. 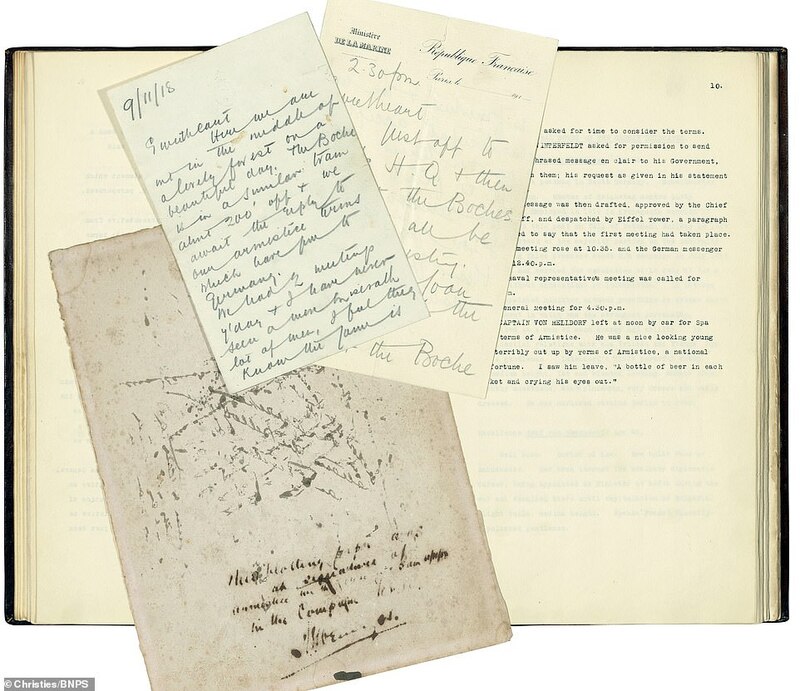 Potentially the Armistice could have been signed two days earlier.’ The sale takes place on December 12. The story of dining car 2419D didn’t end with the First World War. 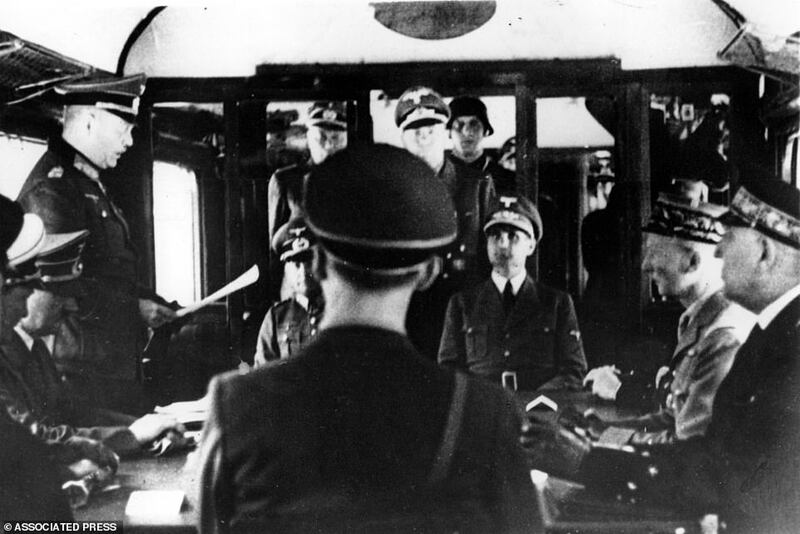 Hitler tried literally to rewrite history in 1940 when the Nazi leader commandeered the dining coach to serve France the same humiliation Germany suffered there on the last day of World War I. The coach became a rallying cry during Hitler’s ascent to power as he exploited the German public’s contempt for the punitive terms of surrender. 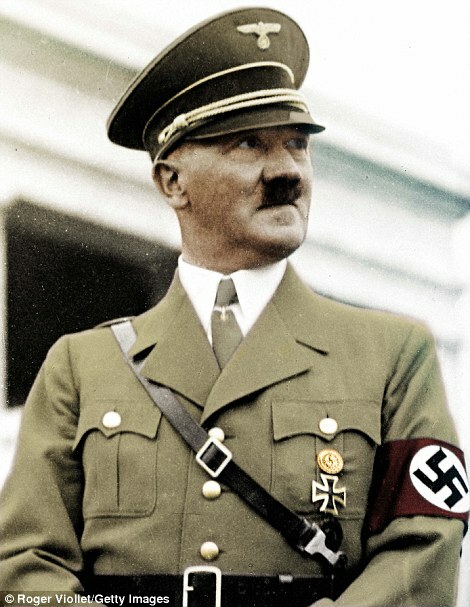 The Nazi leader visited the site in 1940 when his armies conquered France. 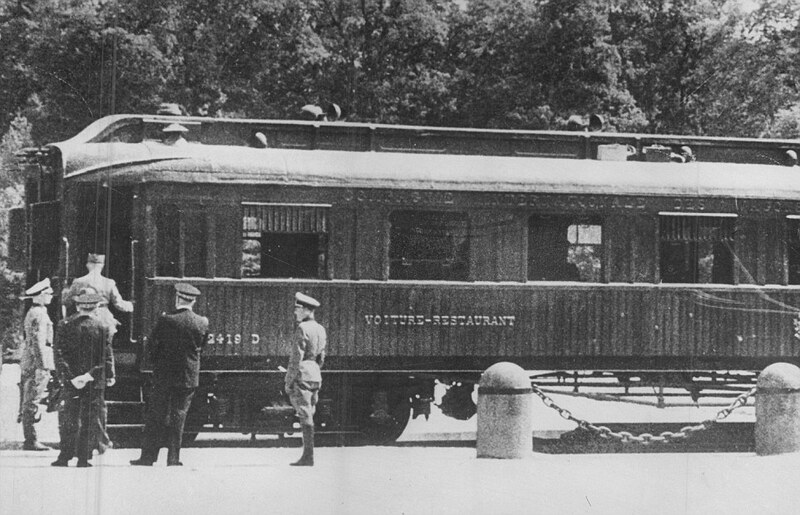 The Fuhrer ordered the dining car brought out of the memorial and returned to the tracks in the spot in the forest it occupied in 1918. What ensued was Hitler’s surreal theatrical restaging of the 1918 armistice, one of history’s most famous events, with the tables turned. 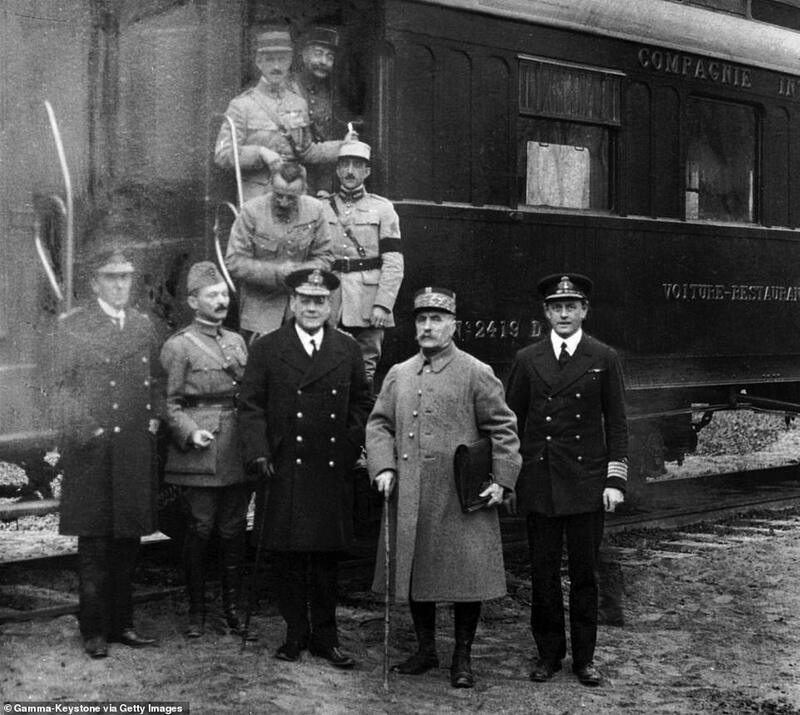 The 1940 Armistice was dictated in that train – with Germany the victor and France the loser.